Naturally fermented foods. Raw, organic, live probiotic sauerkraut and kimchi inspired by local and international flavor profiles. LOCAL CULTURE. Naturally fermented foods. 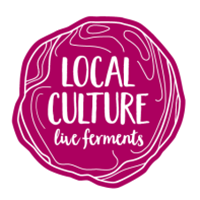 Raw, organic, live probiotic, small batch sauerkraut and kimchi inspired by local and international flavor profiles. Naturally fermented here in Bend, and made from Oregon sourced produce. At Local Culture we are committed to cultivating live foods for living well. To support our thriving communities, we ferment quality organic ingredients from locally sourced agriculture. Loaded with cultured macrobiotics, our krauts will make both your belly and palate smile. The journey of Local Culture Foods began with the growing of a family. With a newborn child on the way we knew we would want to have nourishing foods that we could eat straight out of the fridge, and would go well with everything. From there our experimentation with veggie ferments, just like the wild cultures within them, began to thrive. Our love for wild spaces, tasty foods, engaging communities, and wellness shaped our lives into what can best be described as, Local Culture.